Zion is located in Cecilton, Maryland on Route 282. 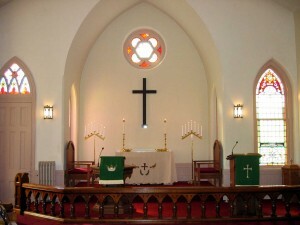 Services are held on Sunday mornings at 11:00 A.M. Directions to the Church can be obtained by clicking here. 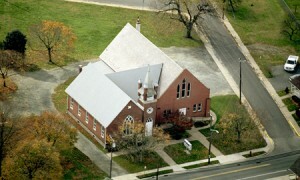 The Parish Sunday School is held in the community hall adjacent to the church. 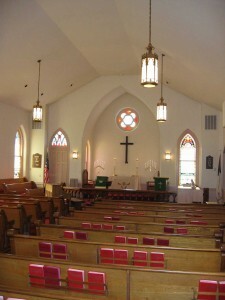 According to the tablet which hangs at the door, The Zion United Methodist Church was founded in 1819. The original building was located on the north side of the road, on land which is now used as a cemetery. It was never fully completed. Another church was erected on the present site in 1850, on land deeded to the church by John Ward Jones. Hardly any records exist concerning the building of the parsonage. An entry appears in the minutes of the Board of Stewards, dated July 12, 1869, reporting they had determined to build a parsonage and had over $3000 subscribed for that period. For many years the upkeep of the parsonage was the responsibility of the women of the church. A little band, known as “The Mite Society,” struggled to keep the parsonage furnished and comfortable. The ladies of the Mite Society met on the full moon, because such evenings were usually bright enough to permit them to travel the lonely county roads at night. The Mite Society later became known as “The Ladies Aid Society,” and it kept that name until September 4, 1940, when it became known as “The Women’s Society of Christian Service.” Later in the 1960’s the name was again changed to the United Methodist Women, as it remains today. On August 21, 1888, a catastrophe fell on the Methodists of Cecilton. On that day, at approximately 3:30 P.M. a cyclone came roaring out of the southwest and destroyed the Zion Methodist Church. While his parents nervously looked on, an eight year old boy, James P. McCoy, Jr. (the brother of Mrs. Edna Smith), crawled into the debris and rescued the pulpit Bible. Ground for the new church was broken on April 2, 1889, and the church was formally dedicated on June 15, 1890. Reverend Thomas Van Dyke was the inspiration and guiding spirit behind the erection of Zion’s Church Hall, or Community Hill, as it is popularly called. He dreamed that the people of Cecilton, Earleville, Warwick, and the surrounding areas would have this as a place to come together for recreation on Friday and Saturday evenings. The project was begun at the close of World War I, when corn and wheat prices were high. The records left to us tell only of the material victories and changes in Zion’s life – its destruction, financial struggles, and its growth. Only God can know and measure the spiritual victories and changes which Zion had helped bring about over 150 years of Christian service.